God gifted me with an ability and drive that I do not doubt. 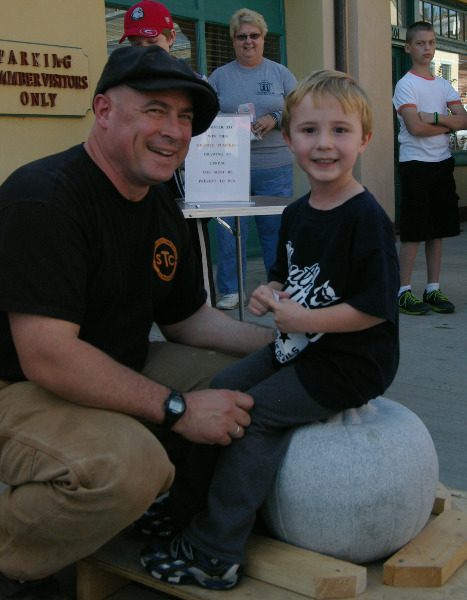 As a 4th generation granite artisan and artist, this is the saga of my personal journey. His father came over on the boat in 1891 to work in Barre, eventually bringing the whole family. My grandfather, his brother and their father suffered great injury from the dust and conditions prevalent in the early years of Barre’s granite industry.. Only my grandfather lived a long life, albeit ultimately dying with hands severely crippled from years of pneumatic tool use and only 10% of one lung of breathing capacity remaining as a result of silicosis. Seeing the detriment of such a career firsthand as I watched my grandfather die made his warnings very real to me. The allure, however, proved even stronger. In 1980, 200 years after the Burning of Royalton, we moved our Jersey dairy herd from Vermont to South Carolina. 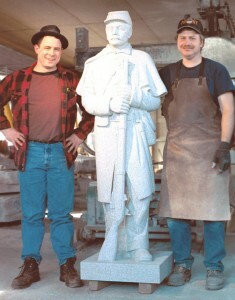 After college and long before I started carving granite, I sought out my Master Sculptor Gary Sassi. As an Executive Chef, years of carving ice with a crystalline structure similar to stone taught me to work fast without abusing the medium. More time as a professional wood carver also impressed him. 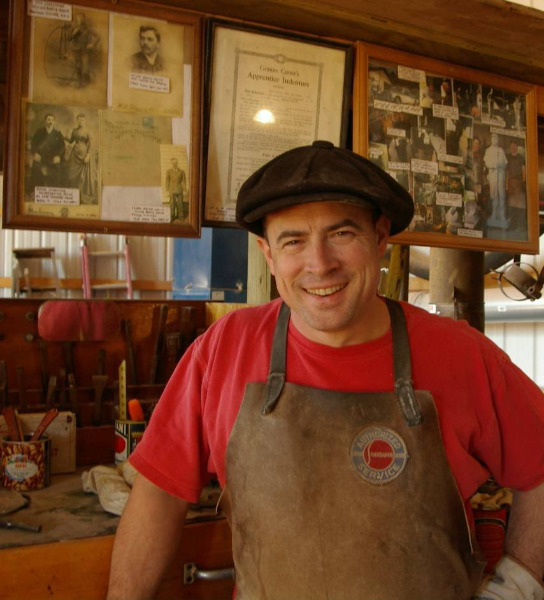 Nearly 10 years later, after selling my house in Tennessee and returning to the family farm of my youth in Chelsea, Vermont to care for aging grandparents, I visited Gary’s Celestial Memorial Sculpture Studio in Barre, Vermont “The Granite Center of the World”. Gary told me I could start the next day. Master Carver & Finisher Andy Hebert was working at the bankers beside me and had little to say to me at first. Andy was already an industry veteran, with iconic projects like the Laquerre #61 racecar memorial that is known around the world in his portfolio. Within the week, my mother visited and recognized Andy as her cousin. At that moment, I became his apprentice and legacy. He mentors me to this day. After moving 1000 miles from Tennessee to Vermont for family, God opened the door for me to carve. As example of how tough this business really is, I unknowingly met another of Barre’s sculptors that first day at Gary’s studio. While Gary was gone for lunch, he came by to see a 13′ tall statue Andy had just completed. Making small talk, he asked what I planned to do in Barre. When I told him I was there to carve but had no experience in stone, he said “Nobody will hire you if you can’t already do it. It’s too expensive to train someone with no experience, too dangerous to let you work on something you might break. This is a lot harder than you think.” He didn’t introduce himself or let on that he was one of the top sculptors in town. His words sounded like ones I had heard years before when other sculptors had similarly rebuked me and kicked me out of their studios as I sought opportunity and instruction- “You’re too old, …should’ve started when you were young enough to learn! …not good enough! …. Quit wasting my time! …Get out of my studio!“. A few months later, after seeing work I had done at Celestial, this same sculptor approached me with a much different tone. “Where did you learn to carve like that? People don’t just learn to carve like that overnight. You’re really good. I mean it. If you ever need anything,” he said with a wink, “don’t be a stranger.” His offer did not entice me, then or later. Gary took the risk to give me a real shot when those others wouldn’t, so he had my loyalty. In the coming years, I learned that Barre’s Master Sculptors Gary Sassi and George Kurjanowicz had opened their doors to each train and employ more carvers and sculptors than anyone else in the industry. 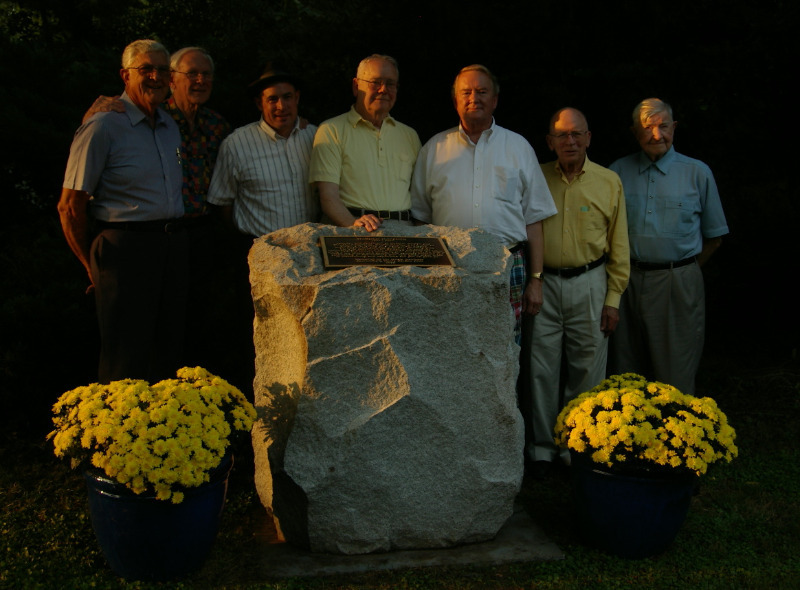 Such benevolent generosity, more than any individual stone that is carved, unequivocally establishes them as Master Sculptors at the top of their generation of this granite tradition. My cousin Andy taught me how to do work no one else in the industry knows or can do. These men set the bar high for me. 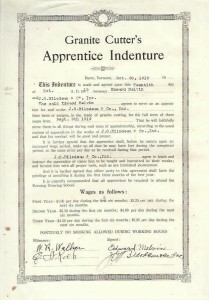 During my apprenticeship, more words from my grandfather inspired me. 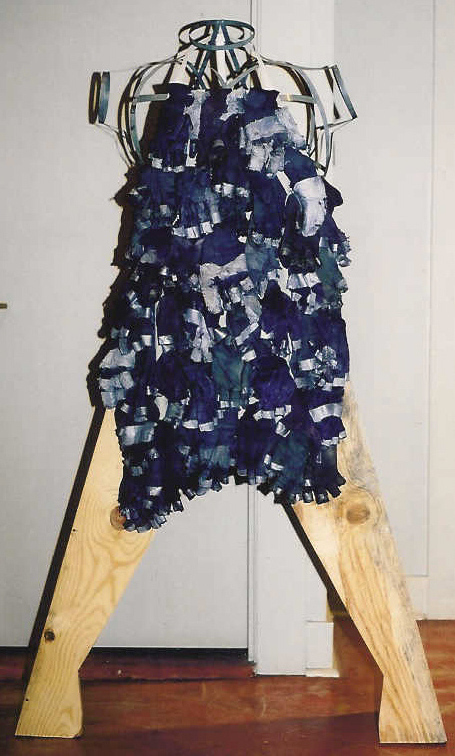 When I was a boy, he often said, “No man can call himself a stonecutter until he has beaten enough skin off his hands to make an apron.” When a local gallery solicited original works from our sculptors’ colony for their inaugural Stone show, debris and detritus from my work were assembled into the critically-embraced mixed media sculpture Apron (pictured, lower right.) Giving succinct form to my grandfather’s words represented my achievements to date. As one of their own, many Masters in Barre taught me well , sharing secrets not meant to leave the inner circle. They provided a living link to the oral history of this way of life, the struggles, who cut what job and what shed they worked at when they cut it. Mastering the methods of pointing under Gary and Andy with either a pointing machine- for 1:1 scale portrait reproduction- or with compasses- to accurately enlarge, reduce or even reverse a model sculpted in studio or from the client- empowered me to produce dependable results. Giuliano Cecchinelli taught me from the Italian perspective, including clay model work and to slow down to actually understand what I could see but did not know. Angelo Ambrosini demonstrated restoration methods and mold making to cast clay models into plaster for use in pointing. Internationally renowned natural forms sculptor Jim Sardonis helped me integrate this often methodical world with fine art, helping me better comprehend his vision of Interconnectedness. Over the years, Andy taught me advanced cutting and finishing techniques like hand axing, hand cut letters and Shell Rock Pitch that few sculptors ever properly learn to do- much less master. It was a great privilege to be welcomed into the fold. Working among his masters, Andy had learned the secrets of the unique granite finisher’s cutting technique called Shell Rock Pitch. Stone is carefully broken off or “pitched” (also called “shelled“, “scalloped” or “shimmed“) in harmony with the granite’s three grain orientations- the run, the rift and the head grain– to produce deep round scallop shaped shells or scoops on the stone face. Shell Rock Pitch leaves a completely virgin broken surface that reflects light brilliantly with no remaining tool marks or stuns. Marble and many other stones sold commercially as colored granite lack the same grain characteristics as true granite. Experience has taught my family that these are not as well-suited for the Shell Rock Pitch process as high quality Barre Gray or Georgia Blue granites are. Normal rock pitch, commonly found around the edges of regular memorials, is easy to produce and may be passed off as Shell Rock but it is not the same. Other sculptors often have to fake Shell Rock by carving, flaming or sandblasting instead of breaking it in the proper manner. All of these methods leave a dull surface lacking sharp crystals to reflect light, not the proper surface I was trained by my cousin to produce. 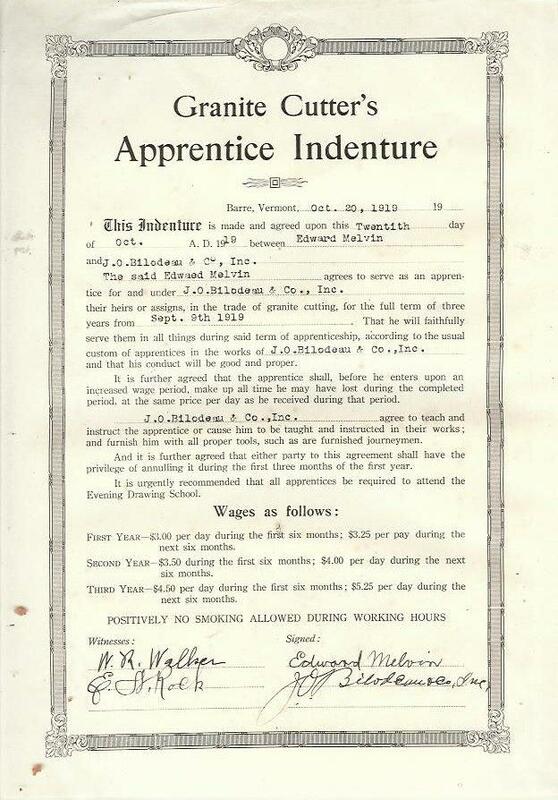 This prize of my training is both a family heritage I am obliged to continue and rare trade secret to protect. When my Master decided that I could carve well enough to survive on my own, that day came. My tenure at his studio ended immediately. In the changing market, significantly diminished opportunity remained to carve elsewhere in Barre. My remaining grandmother died within the week of my newly-realized freedom. So I returned to my family’s adopted home of Spartanburg, South Carolina with expectant wife. We would raise children in our new home next door to my parents, leave granite behind and seek more typical work. We quickly learned God had different plans for me. 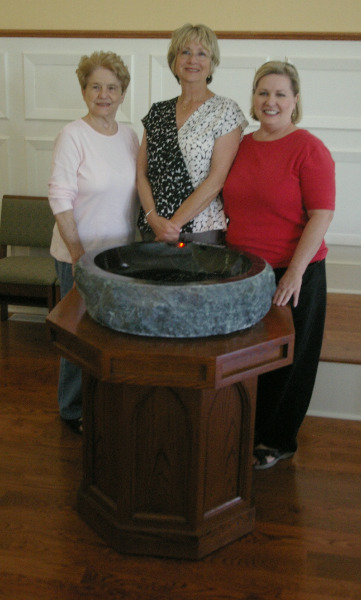 Pictures of my sculpture work circulated. I was soon referred to nearby Elberton, Georgia “The Granite Capitol of the World”, making my first trip there on the day before our daughter Carolina was born. 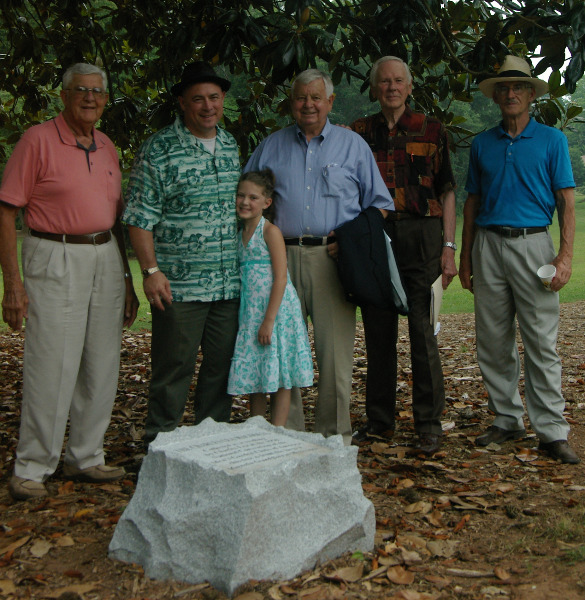 Tom Robinson of the Elberton Granite Association said their last Master Sculptor, Dario Rossi, had just retired. There was need for my work. When I visited Dario, we talked about our small world of granite in his old studio at Harmony Blue Granite Company. Dario quickly realized we were related by marriage. “Ah, that’sa good,” he exclaimed, ” So we’re family!” Then he punched me in the chest- the way Dario likes to do. When I protested, he said, “Ah, it’sa no problem.” and quickly punched me again. After that, he sold me his tools and gave me his blessings. Listening to what he said several years before we met in 2003 during the linked interview, you’ll see why I have realized my path to that day was destiny and not accident. 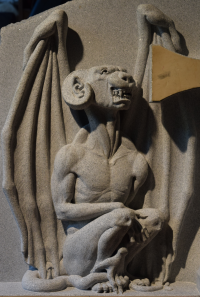 The Saved Sinner Gothic-inspired Gargoyle, Cross and Stele memorial. 0′-4″ bas relief in GA Blue granite. Our new daughter Carolina’s pacifier soon christened the footing of her namesake studio, built entirely new from the ground up by my father and me behind our Boiling Springs home after razing the rotting remains of a small tractor shed. The Carolina red clay floor is homage to the Vermont brown dirt floor I carved upon at Celestial and affords a significant measure of safety for both the stones and me. Western exposure allows ideal control of natural lighting, especially beneficial for bas relief projects. Combined with large doors in a temperate climate, these features provide an al fresco carving environment when working under a permanent roof. Tools chests were built like my cousin taught me. Necessary equipment, like the antique Ruemelin suction booms, was salvaged from Elberton and restored here before installation. The 16′ tall back wall houses an ever-growing collection of tools like beam calipers, pointing machine frames and original plaster models used for various projects. This simple studio, nestled between muscadines, pomegranates, apple trees and chickens, is a wonderful space to keep heritage alive for the next generation. My Master Giuliano paid me a great compliment by saying “it looks like a plain sculpture studio- that’s good” when he saw the first pictures. Additional onsite shops expand capacity and support many of my studio needs. 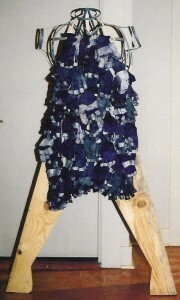 I service work that comes to me from individuals, professionals, other artists and sculptors. Over the past twelve years I have added a wide array of other media to my portfolio including bronze, marble, limestone, serpentine & other softer stone, wood, fabricated metal, fabric and synthetics. 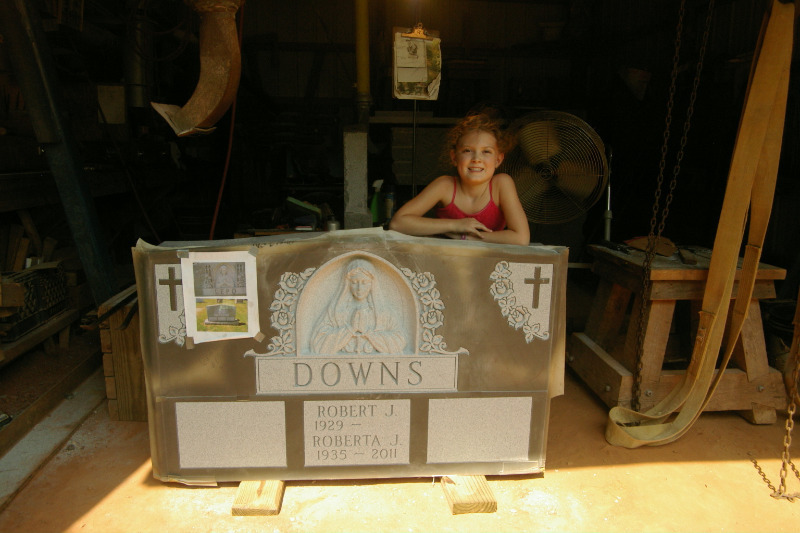 Consider watching Your Carolina’s October 2014 interview or reading Spartanburg Magazine’s Winter 2010 God works through Sculptor’s hands feature article about my work. My family says what I am doing would make my grandfather very proud, in spite of his reservations. After moving 1000 miles from Vermont to South Carolina for family, God opened the door for me to carve. Not coincidentally, the first image on this website homepage is the well-known composition entitled Divine Mercy “Jesus, I Trust In You”. That was the first job sold at our new studio. 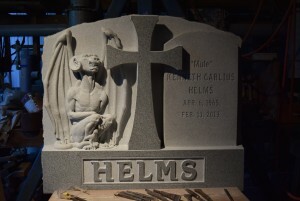 Years later, a friend’s widow asked me to create and sculpt his Saved Sinner good gargoyle memorial, representing an evil soul saved by the grace of Jesus Christ who then dedicates his attention to protecting the cross. Perhaps nothing is easy with granite, but God provides when we follow His will.